Duo Country originaire de Brooklyn (New York) et composé de Zara Bode et Emily Miller. 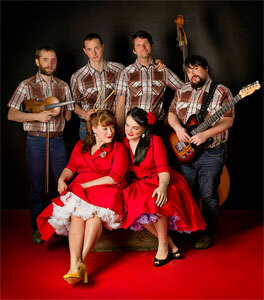 Although formed in Brooklyn during the early 21st century, the Sweetback Sisters model their songs after the vintage country music of 1950s-era Nashville. Central to the group’s sound are vocalists Zara Bode and Emily Miller, who first sang together as part of a traveling choir in 2005. Discovering a mutual love for Hank Williams, the girls began singing country songs after their nightly choir performances. When the tour ended, Bode and Miller both moved to Brooklyn and formed the Sweetback Sisters, whose reputation swelled after a performance on A Prairie Home Companion in 2007. Bode and Miller’s harmonies quickly became the backbone of the Sweetback Sisters’ sound, although the group’s lineup also included four talented instrumentalists: guitarist Ross Bellenoit, guitarist/fiddler Jesse Milnes, drummer Stefan Amidon, and upright bassist Peter Bitenc. Together, the group mined a wealth of twangy influences -- Roger Miller, the Davis Sisters, Nashville country, Western swing -- and made their studio debut by releasing the Bang! EP in 2007. A full-length album, Chicken Ain't Chicken, followed in 2009, and the band reprised their retro honky-tonk style on 2011’s Looking for a Fight.